The late Duke Ellington's orchestras are widely considered to have been the best jazz bands of all time. Among the other big bands of the time Basie band's may have had better soloists, Fletcher Henderson's better musicians, but Ellington took the talents and strengths of the individuals in his band and blended them together into one more so than any other band leader. When Duke passed on in the early 1970s, his son Mercer inherited the band, and kept it going because, as he once said, "The music of Ellington will live on like any of the classics, like the works of Debussy or Schoenberg." While the bands of Ellington were at their peak of popularity in the late 1930s and early '40s, the technology then available to preserve this magical time was primitive by current standards. About four years ago, GRP Records assembled many of the original members of the old Glenn Miller orchestra and recorded Miller's best-known songs with the original arrangements on state-of-the-art equipment. "In a Digital Mood" captured the music of Glenn Miller for all time with the best recording technology available. These same people have now gathered Mercer's current line-up, with some notables from Ellington bands of the past, for the same purpose  to capture Duke's music on digital equipment as it was originally performed. For this album, the original arrangements were transcribed from the old recordings  this is of some historical import, as Duke himself, in his latter years, updated many of the original arrangements, so that his own latter recordings of his band's standards often had different arrangements. Of course, with Ellington, any time you had different personnel, you had a different arrangement  that was his strength, and the challenge of re-creating his music. Yet Mercer Ellington may be best suited to this task, and the result is extraordinary. Mercer and producer Michael Abene recruited Ellington veterans Chuck Connors, Britt Woodman, Norris Turney, Clark Terry and Louie Bellson  men who all new what Duke demanded in a session. "Digital Duke" captures the essence of Ellington's music, taking in the powerful yet exquisitely layered "Satin Doll" to the soft and intricately meandering "Perdido." 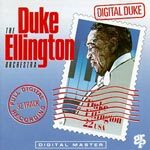 Although Mercer and the band have put out several albums over the past few years, "Digital Duke" is the finest album the Duke Ellington Orchestra has recorded since the death of the man himself.